Most people who have credit cards and then life has thrown them a curve, dream of the day that they will have a zero balance on all of their cards again. The system of credit allows for this, but letting it go too long will wreak your credit history. And recovering from a credit crash is much much harder than building credit in the first place. So what do you need to watch for if you are in this situation? 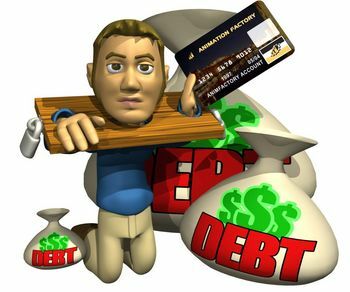 These simple warning signs will point out if you are possibly in danger of creating a situation that will harm your credit. The earlier you catch these signs, the easier a cure will be. The accomplishment of being able to pay off your credit card is a great goal, and will help with your credit rating. If you develop the habit of only making the minimum payment on your cards, you have chosen the slowest, most expensive method to pay off your credit card balance. Yes, you are still making the payments, but you are also impacting how much credit you have available (your balance is taken out of your available credit), plus adding penalties and other fees. And you may lose your rewards, and be turned down for an automatic credit increase. These are not fatal to your income, and you will eventually pay off your credit card. But do the math; using one of the various debt calculators, find out fast you are paying off your credit card, and the effect of paying only $5 more than the minimum per month. You may be willing to make your payments higher once you see these numbers! If you pay your credit card, and then go spend that money during the billing cycle, you are making it harder to pay off your credit card. What you have done is keep the balance exactly where it was- which is great if you are able to pay off your credit card that month, but if you aren’t sure that you can, you have only taken the money you spent on the payment, and not actually changed the balance. This is a good time for a credit card vacation- use it for one thing a month, and add that amount to whatever payment you already are making. You are continuing to use the card, and the payment you made actually reduces the debt. Having a plan to pay off your credit card is a needed first step, and will help you resist those impulse purchases that like to crop up once you have ‘extra’ money. Many of the best methods have been written about, but a simple one is getting your credit report, and finding the list of debts you have, along with all of your credit card statements. Budget carefully: you need to make the minimum payment on all of your debts. Selecting the one with the lowest balance and adding extra money to that specific debt. If you have many small debts, you may be able to pay them off quickly. Then, take that same amount (the minimum payment plus the extra money you have spent to pay it off), and apply that to the next-smallest debt. With multiple cards, choose the ones that have the highest interest rates to pay off first. And watch your budget to pay off credit card debt without making more problems! Multiple people on one card. Having two or more people on one card makes it more difficult to budget for payments, and to avoid going into debt. Communicating about when you spend money on the credit card is a simple way to make sure that you are able to pay off credit card balances together. Having too many credit cards. This is a problem in two ways, not only does it make it difficult to pay off credit card balances, you can fall into the habit of using a higher-interest card to pay for something. This is a path to credit destruction- but be careful about closing out the cards! Simply putting them out of easy reach, and rotating the cards you use will keep your credit score healthy, and avoid getting balances out of the ‘golden zone’ of 30% or less of ALL available credit. Using credit as therapy. Simply because you are offered the credit is not an excuse to use it: you need to make sure that you can pay off credit card balances at the end of the month. And planning on a one-time windfall isn’t good: a lottery win or other unexpected event may well not happen, and if you budget with this in mind, your entire winnings will be taken to pay off credit card balances and other debts. One thing that attracts many people to one card or another is the rewards they ‘earn’ for using their cards. This, on many cards, is a problem to keep track of, and having multiple cards makes this task one that gets forgotten about quickly. If you are using a card specifically for the rewards, make sure that you have a simple, user-friendly way to track your rewards. And in those emails or letters from your card issuer may be a way to increase the rewards, or a complete change in how they are calculated. A few minutes of scanning closely every letter you get from your credit card issuer is worth it. And the real reward? Having the credit card balances something that you can pay off, easily, every month. A plan to avoid problems will let you pay off credit card balances, your other debts, and still have some ‘fun’ money is the goal of a budget- you can do this!